I'm a little mesmerized by this month's inspiration for the Art Bead Scene challenge! 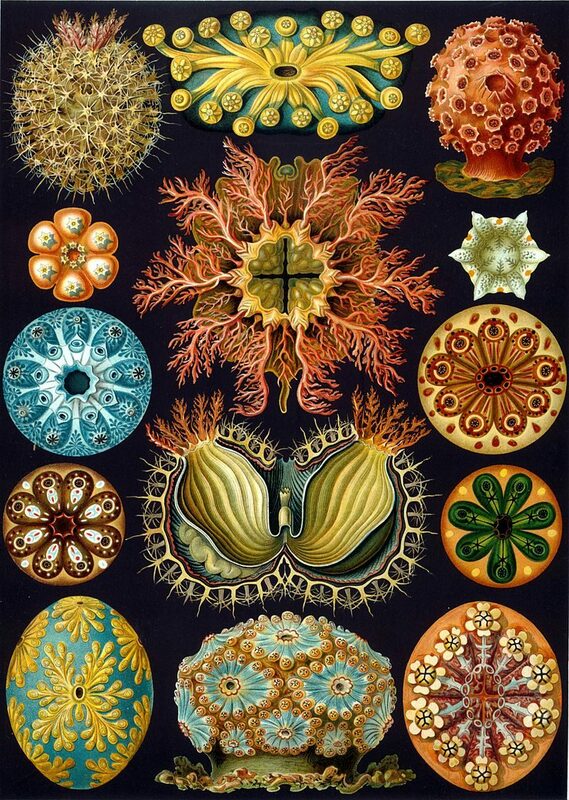 The artwork is one of the plates from the book of Ernest Haeckel's work Art Forms of Nature that portrays ascidians, commonly referred to as sea squirts. Haeckel was a German biologist, naturalist, philosopher, professor, marine biologist, and artist who discovered, described, and named thousands of new species among other accomplishments. You can read more about the artist and artwork HERE. I adore the colors and organic shapes in this plate... so much to be inspired by! The first thing that jumped out at me were the coral-like tendrils coming from the two center images. 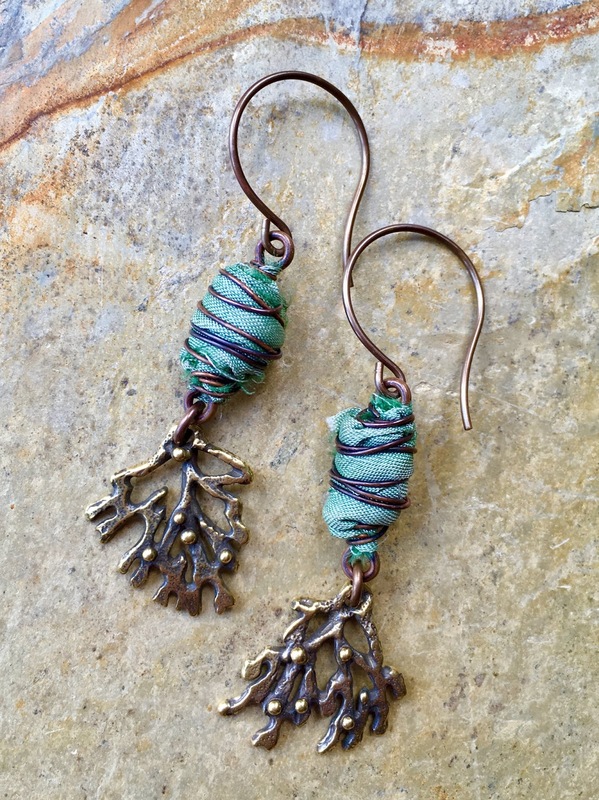 I had already been exploring my small collection of Anna Bronze pieces for another July challenge and found just the perfect elements for earrings in a mismatched pair of bronze charms. I kept my design simple and just attached the charms to a pair of silk cocoons from my friend Anna Pierson of Saga Hus in a soft green. 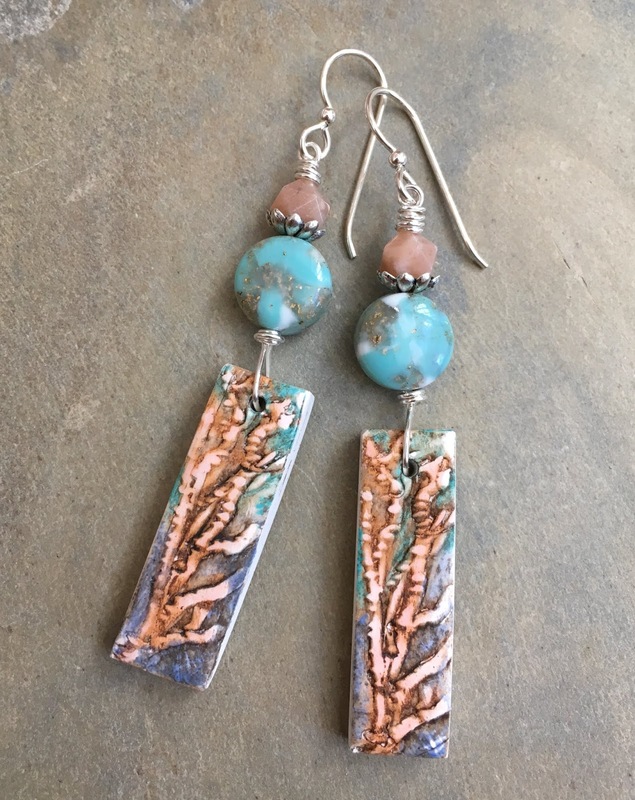 Despite some big plans, I only managed to make one other design this month... another pair of earrings with coral designs! This time I used some cute charms from Heather Powers of Humblebeads. 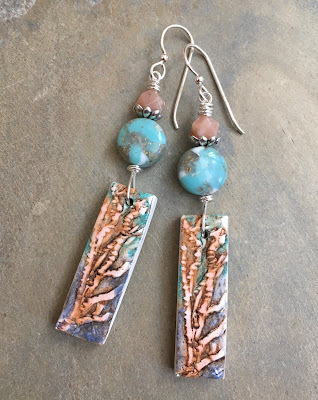 I wire wrapped some fun mottled turquoise and gold flecked coins along with star cut peach moonstone beads and hung these cuties on sterling silver ear wires. I'd love to say that August will be a more productive month, but we've got even more travel on the docket. Hopefully I can still manage to get something made for my favorite challenges. Fingers crossed!! These are great earring designs!